Lana went above & beyond! I will be referring all my friends & family to Lana & Shirley! Thank you for the great experience!! Lana was really amazing! Thank you so much for your time and patience in helping us find a home! We will definitely refer anyone we know who needs assistance buying or selling a home your way. Thanks again!! We bought our house from Lana Ames last July. Unfortunately, this survey got buried in some paperwork. Her service and support was to outstanding and I still wanted to complete this. She facilitated this sale while I was in NY & the sellers were in China. Her follow through and thoroughness were like I've never seen. We have bought/sold a number of houses through the years & Lana is at least a 10 - A better agent than any we have encountered. We are raving fans & would/will recommend Lana to anyone I know & will engage her again should we decide to sell. LANA IS THE BEST! My agent Lana Ames was absolutely the best!! A real "go-getter." Always prompt, informative, knowledgeable, accommodating, friendly & pleasant. She made the whole experience of house hunting so fun! Believe me that doesn't go unappreciated. I will use her services again in a heartbeat! Andrew Stone & Lana Ames are both friendly, competent & tenacious professionals. we were blessed to have them represent us on a tough sale of our Draper property!! I'm sure this will be a first for you to receive a thank you note six-no seven months late! If I could somehow tell you all the times I've thought of your kindness when we both our condo at the Meridien, you would know it has been a "failure to launch" and not one of the heart. 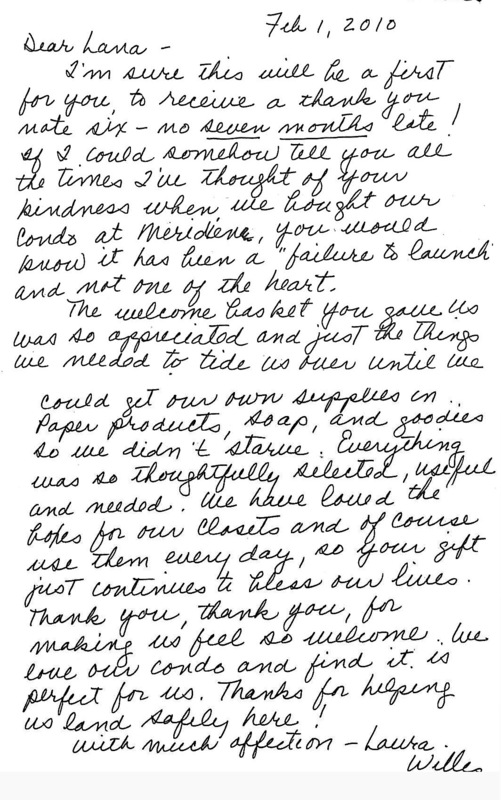 The Welcome basket you gave use was so appreciated and just the things we needed to tide us over until we could get our own supplies in.. paper products, soap, and goodies so we didn't starve. Everything was so thoughtfully selected, useful, and needed. We have loved the hooks for our closets and of course use them every day, so your gift just continues to help our lives. Thank you, thank you, for making us feel so welcome. We love our condo and find it is perfect for us. Thanks for helping us land safely here! Lana Ames was very professional and a real pleasure to work with. We would refer a friend to Lana for any of their real estate needs in Utah. Lana Ames is the best agent. She was very professional and kind. 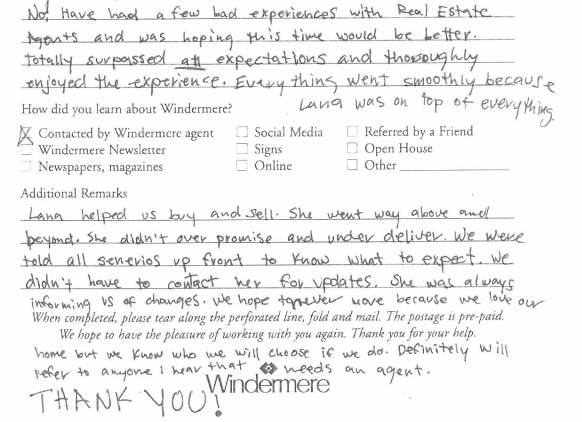 Buying a home in these difficult times can be emotionally draining and she was with us every step of the way. I appreciated how she ALWAYS returned my phone calls promptly. Lana Ames was fun to work with, made all appointments on time, some with very short notice, LISTENED very well and answered all of our questions completely. She was always extremely professional both in her verbal representation and in her appearance. She walked us through every step of the purchasing and selling experience. We would highly recommend her to anyone interested in real estate. She is excellent! 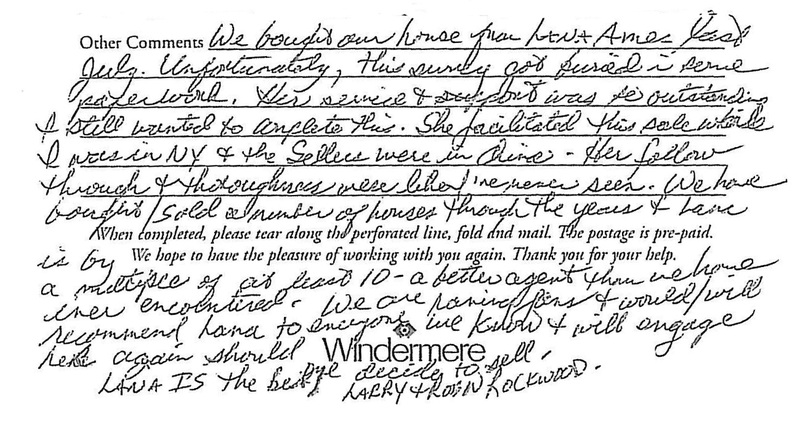 We appreciated the several letters we received from your company office as well. Lana was a great Realtor to work with. She has an excellent work ethic and is very professional. She always returned my calls promptly and has very good communication skills. I feel she had my best interests at heart. I would recommend Lana to anyone looking to purchase a home! Lana Ames was great to work with. She went out of her way to help. She knew what i wanted & what price range- didn't try to push. Great experience. Lana is very professional and accommodating. A winner!! Lana provided excellent service, knowledge, and professionalism! Lana was wonderful to work with. She was always available and her advice was always spot on! Thank you so much. Everything was perfect!! Lana Ames is the best! Kris and Lana were great! Lana Ames did a super job. She was an immense help. Hi Grady! Hope all is well. Thanks for everything Lana! I really like the way that Lana & Shirley were both directly involved and would cover for each other & support each other when necessary. It gave us the feeling of complete support for our process. 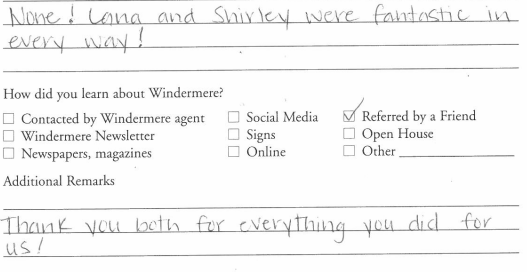 Lana & Shirley are the best!! Lana Ames was superb. She is the hardest working agent and really cares for her clients. In our opinion there's no one better! Her communication skills are outstanding. She was always on top of every situation. No! Have had a few bad experiences with Real Estate agents and was hoping this time would be better. Totally surpassed all expectations and thoroughly enjoyed the experience. Everything went smoothly because Lana was on top of everything. Lana helped us buy and sell. She went way above and beyond. She didn't over promise and under deliver. We were told all senarios up front to know what to expect. We didn't have to contact her for updates. She was always informing us of changes. We hope to never move because we love our home but we know who we will choose if we do. Definitlely will refer to anyone I hear that needs an agent. THANK YOU! Can't say enough great things about Lana! OUT-FREAKIN-STANDING SERVICE! We will refer everyone to Lana. PROFESSIONAL-FRIENDLY-KNOWLEDGEABLE! None! Lana and Shirley were fantastic in every way! Thank you both for everything you did for us! Shirley & Lana did everything perfectly!! 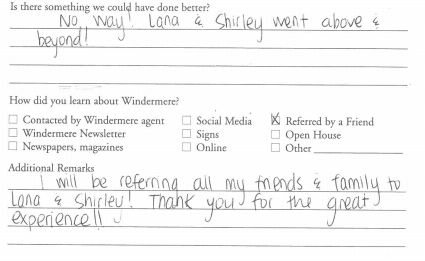 We have absolutely LOVED working with Shirley and Lana. They have gone over and above in helping us find our beautiful new home! They are AWESOME!! Lana Ames is a great realtor. Very professional & knowledgable. I would highly recommend her! Thank you for being so kind and patient with my mother in law.